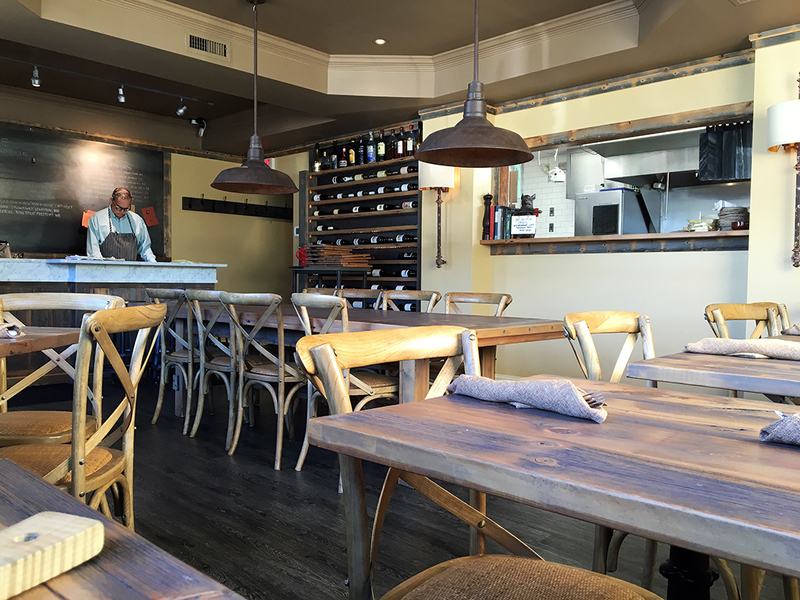 We stumbled upon Table while looking for somewhere new to eat just east of Providence, RI. A quick internet search brought up a small restaurant called, “Table.” It seemed like a nice place with relatively easy access right off of route 114. Like many small restaurants, the hours can be a little wonky, so call ahead or check online to make sure they are open. They also have a limited kitchen offering for two hours in the middle of the day between lunch and dinner. We decided to go for lunch and sample the lighter menu with slightly lower prices, but I’m sure we’ll be back to try dinner as well. Table is tucked away in a little strip mall with limited parking, but the location is nice and modern looking. The interior is modern yet rustic with a lot of wood and an open kitchen, which made it feel comfortable yet classy. 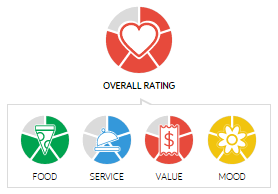 The service is friendly and welcoming, albeit a little spotty in places. At one point we were the only people in the restaurant, but our food seemed to take an oddly long amount of time to come out. That is perhaps an indication that the food is cooked to order and nothing is pre-made, so perhaps it’s a good thing. Just prepare for a leisurely lunch. In general the food at Table is really good. Everything we ate was well prepared, presented beautifully, and full of flavor. The menu changes occasionally so don’t rely too much on the online menu, but instead use it as a guide. 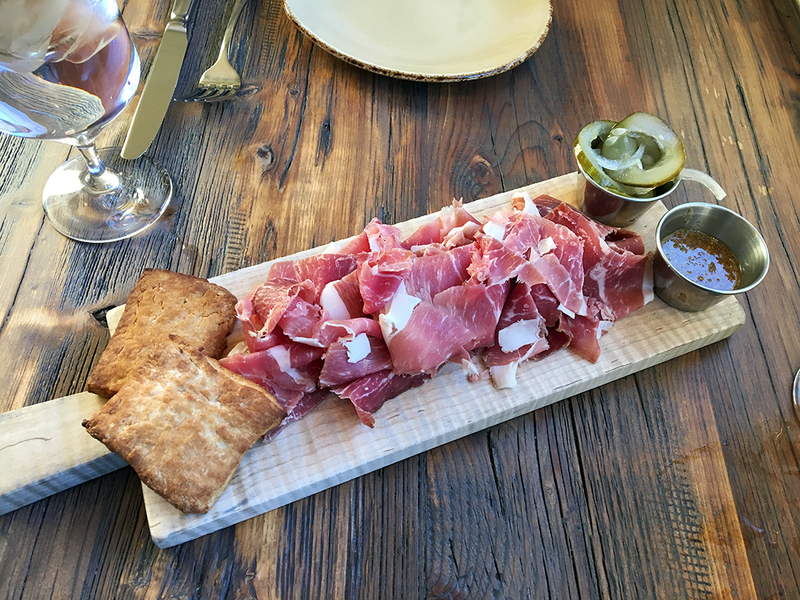 Prosciutto Board – As an appetizer, we ordered the prosciutto board that comes with two biscuits, sweet mustard, and some pickled vegetables. Most places skimp on their meat or cheese boards and we were ready to receive a small sampling of the items. Instead, our server brought us a mountain of freshly sliced prosciutto and two nicely sized biscuits. We couldn’t believe our eyes. The prosciutto was mild in flavor, not too salty, and paired wonderfully with the mustard as well as the biscuits. The pickled vegetables provided an acidic balance to the fatty meat, but they were perhaps a bit on the vinegary side for me. I would definitely recommend this generous appetizer that we couldn’t finish even though we tried. 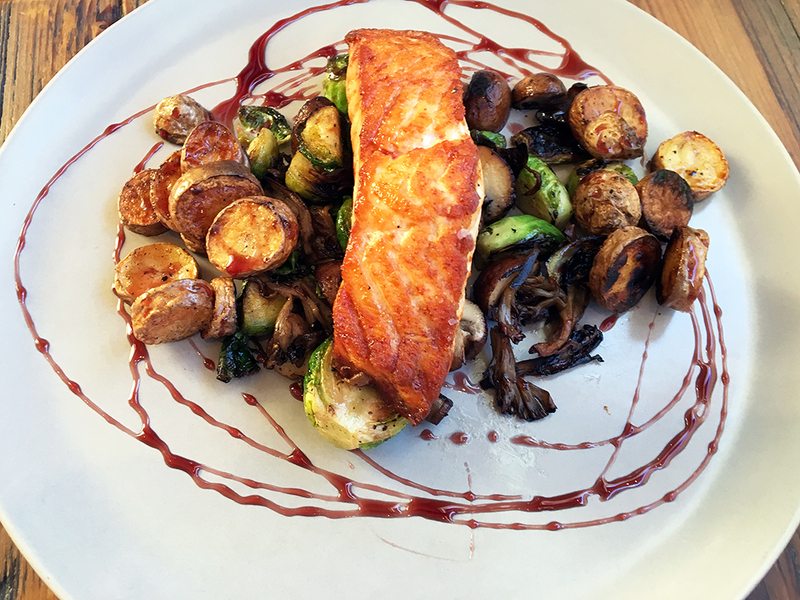 Salmon – My wife ordered the pan seared salmon. I’ve said it before, but I’m not a fan of cooked salmon. It just doesn’t do it for me. Nonetheless, I thought this salmon was cooked wonderfully with a nice sear on the outside and a fresh flavor that wasn’t too fishy like a lot of ill-prepared salmon at some places. With that said, the real stars of this beautiful dish in my opinion were the vegetables! The roasted potatoes and mushrooms were absolutely fantastic. They seemed simply prepared, but the flavors really jumped out. 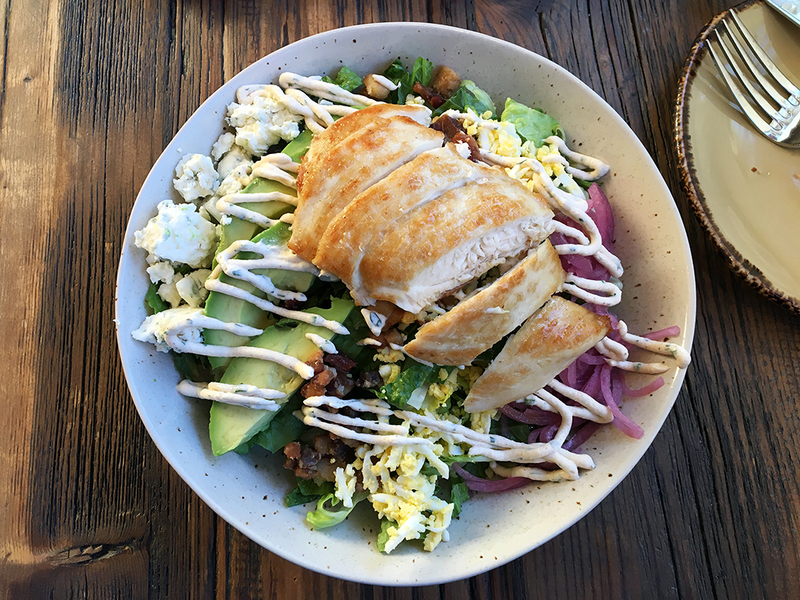 Cobb Salad – I ordered a Cobb salad with chicken. Once again, the dish has an absolutely beautiful presentation. The chicken breast looked like it was pan seared to a nice golden color and the interior wasn’t dry at all. I appreciated the chopped salad approach because I personally like my salads cut this way instead of big and clumpy. The flavors were simply, but tasted very good. It’s hard to mess up a salad, but it’s not always easy to present it so nicely. Table is a small restaurant with a seasonal menu that serves freshly prepared and beautifully presented food that comes at a reasonable price. 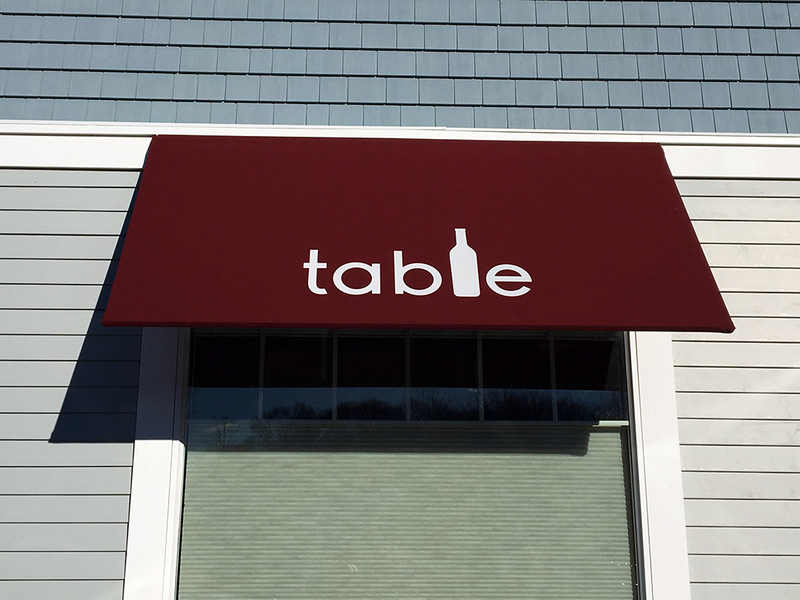 I would recommend Table as a great place for lunch or dinner in the Barrington, RI area.